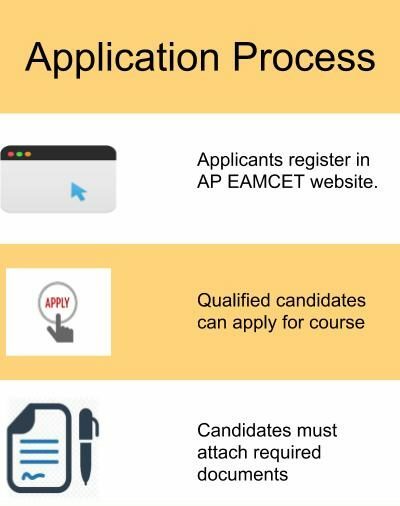 Candidates must visit the AP EAMCET website to start the application process. 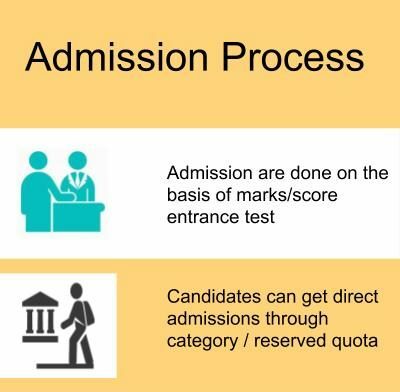 After clicking on the AP EAMCET tab, the candidate will be directed to a page that lists the 4 steps of application. The first step is the payment of application fees, which can be done using a credit/debit card. Candidates are required to fill in particulars such as last qualifying exam hall ticket number, DOB, course applying for and so on before the payment page is released. Once done with the payment process, the candidate can proceed to fill the application form with all the requisite details. Scanned copies of recent passport-size photo and signature will be required at the time of filling the form. After all the necessary details have been filled, the applicant can click on the "Submit" button and take a printout of the submitted application form for future references. Exam Hall Ticket should be downloaded from the AP EAMCET website before the designated entrance exam date. The candidate is allotted seat and course based on his/her marks in AP EAMCET and choice of course and study center. The final merit list is declared after counseling. Candidates are required to produce original copies of all relevant documents at the time of counseling for verification purpose. Qualified candidates in the previous year can also get an admission through reserved / category quota in Institution. Applicants can also join the Institution on the basis of secured marks/rank through reserved/category quota. Allotment of seats and study center is subject to rank/score secured by the candidate in the entrance exam. Qualified candidates of GATE / AP PGECET can get an admission for the respected course. Applicants can also join on basis of secured marks or rank through category-based / reserve quota. Seats are allotted based on the applicant's performance in the entrance test and marks secured in the concerned qualifying exams. Maximum duration to complete B. Tech program is 8 consecutive years. For management quota admissions, selections are subject to merit. For applicants from reserved categories, the minimum percentile in the last qualifying exam is relaxed by 50%. Seats for APPGECET candidates are opened only after filling of seats for GATE candidates. EAMCET entrance examination was the eligibility criteria for joining and also with paying money on our own we can also join. I am a lateral entry student(diploma holder) so I entered with ECET only. I got 3000 rank in the ECET exam for the mechanical department it is enough for lateral entry students. If any inter-student wants to join, he must get below 50,000 rank in EAMCET, in case, he is from OC caste. I am a student in Aditya Engineering college, presently pursuing the final year B.Tech program . In Aditya, the intake is 60 seats out of that 60 % seats are reserved for local and 40% seats for other state students. For getting selected for petroleum course. I wrote a common entrance examination named Aditya EEE exam which is conducted on a state level and according to rank counseling is made. I got state rank as 91 and according to rank, I was on the list of the first day of my counseling. I went for counseling by taking all my school level certificates, there in the panel judges asked many analytical and common questions as the admission procedure, which I was able to answer. Later they told me that many students opted for this course and they have divided 2 seats for each state, so according to the overall academic evaluation, they will select two candidates from this state which they will intimate later.After completion of all counseling dates, I got a call from the selection committee that I along with one more student from Bokaro (Jharkhand) has been shortlisted for this course. The eligibility criteria for this course is that student should pass 10 th . After that they has to write an entrance exam called POLYCETconducted by the state of ANDHRA PRADESH. In this POLYCET exam the students should got minimum 35 marks to qualify the exam. After qualifying the exam the student should attend for the web counselling and he has to select the college. I had been attended to AP ECET entrance exam for getting an admission in Aditya engineering college. Our course is a course which is not available in all colleges. For admission, eligibility is to provide all the required documents in a right way. To get admission into engineering we have to attempt AP EAMCET 2018 examination. If you get a good rank you can choose your own course, If you don't obtain a good rank you get your course according to your rank. To get admission into engineering we have to attempt AP EAMCET for examination. If you get a good rank you can choose your own course. If u don't obtain a good rank you get your course according to your rank. The eligibility criteria for joining B.Tech course at Aditya Engineering College is clearing the AP EAMCET exam. I secured 87070 marks in AP EAMCET exam. The eligibility criteria in AEC for locals is EAMCET counseling and jee mains and has to take up entrance exams conducted by Aditya Engineering College. There is an entrance exam called polycet. By the Marks we obtained the rank will be decided and we may go through councling process and then Seat will be aloted. I came to Aditya Engineering college by management quota. Mechanical branch the cutoff will be around 60%. The candidate must clear the AP EAMCET exam and must have passed the 12th from a recognized institute. Minimum 50% cutoff mark is required. Eligibility is based on the AP EAMCET result. The college's conducting entrance test for the students Who are not qualified in AP EAMCET. The eligibility criteria are based on the AP EAMCET rank. I joined in Management Quota. 60% is the minimum cutoff for campus placement. Eligibility intermediate(12th standard) and have to secure a good rank in Eamcet examination which conducts in state level. Candidate must clear the AP EAMCET exam and must have passed the 12th from a recognized institute to get admission in this college. I had appeared in AP entrance exam and qualified and got admission in Aditya. The eligibility for me was Diploma in mining. I appeared in an entrance exam for the admission and the exam was conducted by the college itself. The admission process is based on EAMCET exam. I haven't felt this course difficult yet . The eligibility criteria are 60% by intermediate examination. The required entrance exam is ECET. What is the Admission Process of Aditya Engineering College, Surampalem for B.Tech in Computer Science Engineering Course?